tour starts with visiting Davit Gareja - Gareji that occupies tens of hectares of land is the largest complex of monasteries in Georgia. It includes Davit’s Lavra, Dodos Rka (Dodo’s Horn), Natlismtsemeli (Baptist), Bertubani (Monks’ Place), Udabno, Tsamebuli, Kolagiri, etc. In the past their total number amounted to twelve, which gave rise to the name of the place “Twelve Monasteries of Gareji”. The monastery was founded by Assyrian Father Davit of Gareja who came to this place with his student Lucian in the 6th century. Bodbe - History ascribes building and decorating the temple to the first Christian King of Georgia Mirian and his son Bakar. This is where St. Nino, enlightener of all Georgians, died and was buried. The church acquired its current shape in the 9th century. Bodbe has always been an important monastic and educational center and had a significant role in the political life of the country. then you will walk along streets of Sighnaghi - The name of the town comes from Turkish word “Siğnak” meaning a shelter - has had a rich history as a central hub for tradesmen and artisans.In the current form of a town Sighnaghi originated on the ruins of a previously existing fortress in the second half of the 18th century during the reign of King Erekle II. It occupies nearly 40 ha of land and circumference of the wall is 2.5 km. The fortress has 23 towers and 5 entrances. also you will enter at the museum of Sighnaghi then drive to village Mirzaani and visit Niko Pirosmanashvili state museum. drive to Gurjaani and visit Gurjaanis kvelatsminda - two dombed church of 8th century, is a wonderful example of a transitional period in the Georgian culture. This 8th century church of Dormition of the Virgin is unique in the way that it is the only two-domed temple in Georgia. The encircling path lies on the second floor. One of the multiple traditions relates that as one of the miracles by Virgin Mary, the cathedral had milk overflowing from its walls. This is why it was frequently visited by nursing and dried up mothers. The pilgrims usually returned home cured. Nowadays it is a site for a fully functioning monastery. then walk along new reconstructed city Telavi and visit Telavi state museum. dinner and overnight in Telavi at the guest house. drive to Alaverdi Monastery was founded in the second half of the 6th century by Assyrian Father Josef from Alaverdi who is buried in the Monastery. 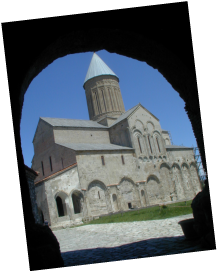 Alaverdi St. George Cathedral was built by Kakhetian King Kvirike in the 11th century. It is 50 m high. The cathedral has retained remains of artwork of the 11th and 15-16th centuries, drive to Kvareli and visit Ilia Chavchavadze state house museum also Kvareli lake. after that drive to Gremi - The history of this magnificent town turned out to be too short – from the 16th century to the first decade of the 17th century it was the capital of Kakheti. It consisted of several districts: church, royal residence and commercial neighborhoods. The Archangel Church, considered one of the masterpieces of late Medieval Kakhetian architecture. at the end of tour you will visit Nekresi - The town of Nekresi was founded by King Parnajom in 2-1st centuries BC. In the 4th century AD King Trdat built a church in the town, which is now one of the oldest Christian churches in Georgia. In the 6th century one of the Assyrian Fathers Abibos started to live there and founded a monastery. Nekresi was an important spiritual, educational, cultural and also a political center. It was the source of Kartlian political and cultural influence on the Eastern Caucasian highlands. Nekresi complex includes a small basilica of the 4th century, a three church basilica of the 6th century, a peculiarly planned domed church of the 8-9th centuries, a palace of the same period, refectory, a tower of the 16th century, etc.